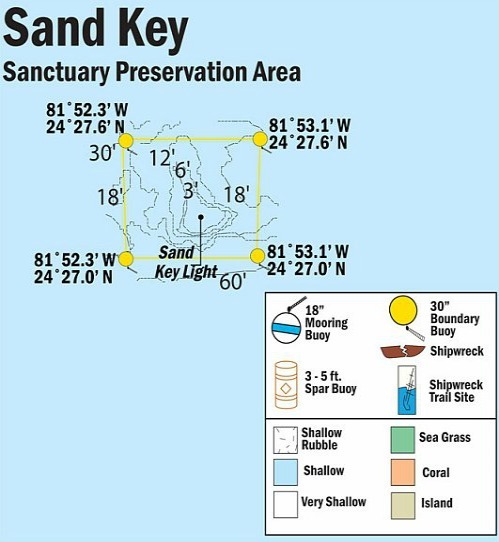 Sand Key is a Sanctuary Preservation area that is most aptly named. It's sand is just one of the features which enhance this scuba diving Florida Keys hot spot. It's makeup is also different from other coral reefs in the area because it was originally an island by itself. Due to erosion from Florida hurricanes and other storms, it has been reduced to this very small patch of sand surrounded by coral reef. 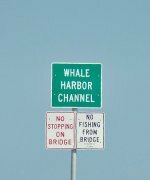 This history of erosion still plays a key role in what you can expect when Florida Keys snorkeling or diving this reef. The shape of the island changes with the wind and wave action, which makes each trip here totally different. These factors also have a strong impact on visibility, which can range from poor to very good. This is also one of the most popular Florida Key West diving and snorkeling sites due to the variation in water depth, and of course for the sand. The sand is an especially nice feature you don't usually have at other Florida coral reefs. It actually makes it possible for you to get out of the water and see things from a different perspective. If you want a truly amazing "perspective" of the area, you can climb the red iron landmark. 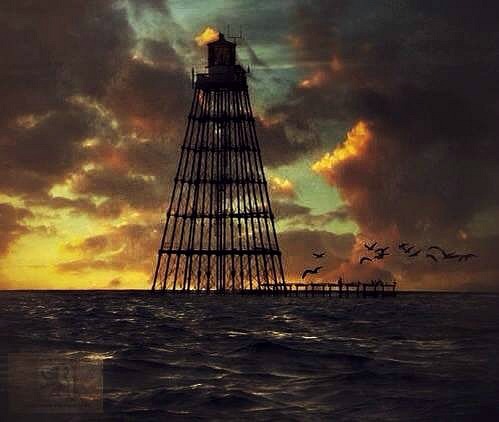 This 1853 lighthouse stands 110 feet tall, and visitors are allowed to climb it's towering height. From here you'll be rewarded with a spectacular view of the ocean and Key West far off in the distance. This standard spur and groove coral reef is laid out with numerous fingers and small canyons or gullies running 5 - 20 feet deep. 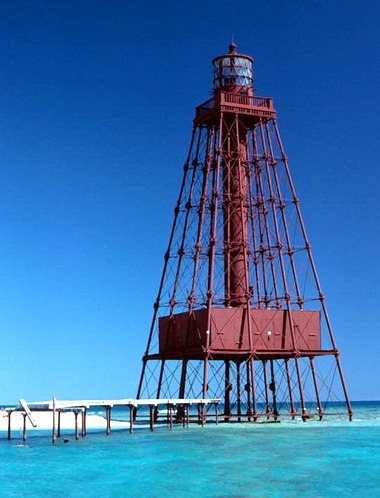 The inner areas and the north side near the lagoon are best for Florida Keys snorkeling. Depending on the season, you'll find that the north side can be quite crowded. The oceanside of the reef is where the deeper water is found. This south edge has a gradual slope and in most places it descends to about 65 feet, in others to about 85-90 feet. The shape of this Florida coral reef, with it's varying water depths and sandy features makes this one of the best snorkeling and Florida Keys dive sites for anyone diving in Key West. With it's susceptibility to mother nature's forces, it also makes this an extremely popular destination. It's not often you can return time and again to the same Florida Keys scuba diving spot and yet feel like it's your very first visit.